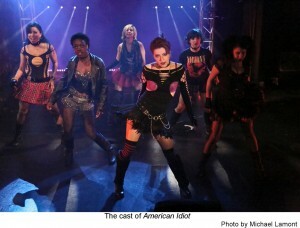 An energetic and talented cast brings Green Day’s classic rock musical, AMERICAN IDIOT to the MET Theatre in Los Angeles. The story of disenfranchised youth living in suburbia who must choose between following their dreams or accepting a life of mediocrity is a passionate, bawdy and a highly octane charged two hours of theater that has already enjoyed a healthy run on Broadway, with a Tony nomination for Best Musical and a GrammyAward for Best Musical show album. 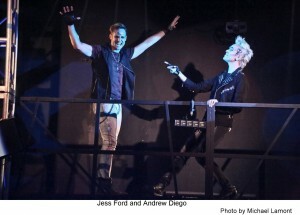 Beyond it’s Broadway run “American Idiot” has seen two national tours criss-cross the United States and beyond. While DOMA’s production isn’t Broadway, it is a well crafted presentation from director Marco Gomez, with an elaborate set, colorful costumes and a stand-out five piece rock band on stage led by Keyboard Player/Musical Director/Conductor, Chris Raymond who along with David Abrams (Guitar) Andy Moresi (Guitar II) Graham Chapman (Bass) and Logan Shrewsbury (Drums) provided the powerful, driving back-beat for the show. This production certainly raises the bar for musical theater in L.A. The vocals in “American Idiot” are spot on, the dance numbers impressive, particularly considering the size of the venue. An enthusiastic cast delivers heart felt performances that certainly touched the sold-out audience at the Met Theatre last Saturday night. That’s not to say the show wasn’t without some minor problems. A couple of missed lighting cues and a microphone that was cutting in an out were just a few of the minor glitches, but they were ones that are easy to forgive. That’s because this musical speaks to it’s audience with haunting melodies that are hard to erase from your mind. I swear I was singing “21 Guns,” one of the many stand out numbers, in my dreams after seeing the show. The ensemble, many of them former DOMA members, also includes Alex Allen, Sandra Diana Cantu, Tony Cellucci, Kevin Corsini, Blair Grotbeck, Lilian Manansala, Angeline Mirenda, Johnny Ortiz, Nohely Quiroz, Michael Restaino, Brittany Rodin, Marni Stone, Dekontee Tucrkile, Lauren Tyni, Ty West, Anthony D. Willis and Everjohn Feliciano whose beautiful voice and perfect harmonies were a treat to listen to. Kudos must also go to set designer John Iacovelli, lighting and projection designer Jean-Yves Tessier, sound designer Julie Ferrin and costume designer Michael Mullen. DOMA’s production of “American Idiot” does this show justice. Slick, well paced and poignant, this is one rock musical that’s not to be missed. 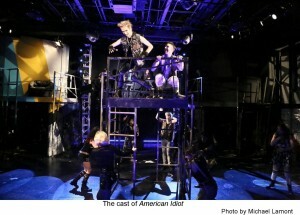 “American Idiot” runs Fridays and Saturdays at 8 p.m. and Sundays at 3 p.m. from June 5 through July 26 (dark July 4). Tickets range from $30–$34.99; seniors and students with ID pay only $20. The MET Theatre is located at 1089 N. Oxford Ave., Los Angeles CA 90029. For reservations, call (323) 802-9181 or go to www.domatheatre.com.